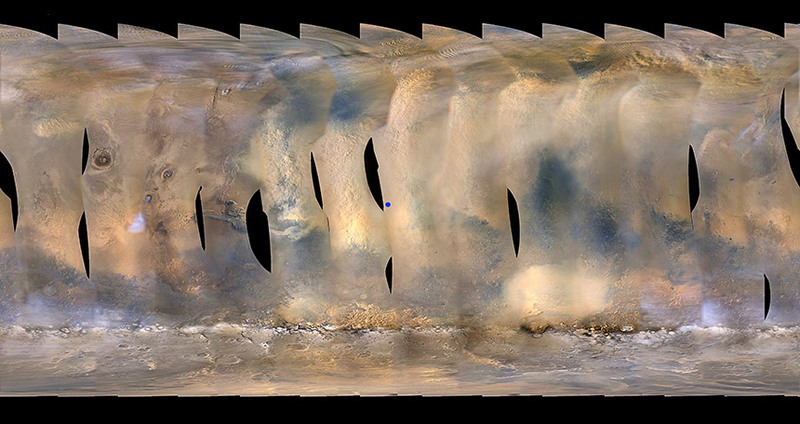 HANG IN THERE This global map of Mars, produced by the Mars Reconnaissance Orbiter, shows a gathering dust storm, which has blanketed a portion of the planet and NASA’s Opportunity rover (marked with a blue dot). NASA’s Opportunity rover has gone into survival mode while waiting for a historically large dust storm on Mars to pass — or for the vehicle’s batteries to run out. Opportunity charges its batteries with solar panels, so a storm such as this that blocks the sun and turns the Martian day to night poses a threat to the rover’s survival. A Mars orbiter first spotted the storm on June 1, and Opportunity’s power levels dropped significantly by June 6. Hunkered down in Perseverance Valley, the rover was still transmitting to Earth as of the morning of June 10. At that point, the storm spanned more than 18 million square kilometers — more than twice the area of the contiguous United States — and was letting in only 0.002 percent of sunlight to the region beneath the storm. That’s a record level of murkiness; the Martian atmosphere typically lets in about 60 percent of light. The mission team can’t shut Opportunity down entirely to preserve the battery without risking the rover freezing to death in the frigid Martian environment. But the rover hasn’t had to run its heaters yet either, and the dust acts as a blanket to trap heat around the vehicle. “We are doing our best to conserve power, but we don’t know what will happen,” says planetary scientist Abigail Fraeman of NASA’s Jet Propulsion Lab in Pasadena, Calif. Opportunity weathered a milder dust storm in 2007, but the rover is much older now.